All attendees must be 13-19 years of age, as of March 16, 2019. Sorry, no exceptions. Registration Fee includes one formal photo choice per student. 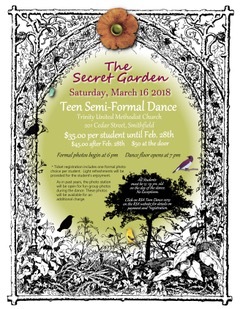 Light refreshments will be provided during the dance for the students’ enjoyment. (1) Print and sign the registration form. The form requires signatures from both the student and the parent. The forms (and payment, if you are paying by check) should be handed to Carrie Butler (ask at the Admin Desk if you need help finding Carrie). Signed forms and payment may also be mailed to RSA at P.O. Box 176, Carrollton, Virginia, 23314. (2) Pay the dance registration fee ($50 at the door). (3) The registration fee includes one formal photo choice per student. Fun Photos will also be available throughout the night; for $10, come back to thephoto station as many times as you'd like during the evening. Photos will be available for viewing and download through an online gallery within two weeks following the dance. Checks for Fun Photos should be made out to Debbie Lawrence.